I picked this little beauty up at the old "Friends of the Library," sale this past spring, for an astonishing 2 bucks! I just had to have it, because the author, Homer Hickam, is the author of the book Rocket Boys, which October Sky, the movie, is based off of. And I just love me some October Sky. Plus, Jake Gyllenhaal's smile just melts me everytime. So, on the cover of my book, there is a quote by Stephen Coonts that says, "Homer Hickam is the best natural storyteller I've read in years." This book is a historical fiction, based off of some historical facts, which makes it even more intriguing! Set on a fictitious island in the Outer Banks of North Carolina, at the start of WWII, the story follows a band of islanders going about their business, when German U Boats (a type of sub,) begin wreaking havoc on the shipping lines. Now, I know nothing about boats, torpedos, submarines, or the navy, but it was a very compelling story, and it had you wrapped around it's pretty little finger from the beginning. A mystery stretches the entire story (missing child!) plus there is romance (sigh, beach romances are my thing,) and lots of German words throughout. If you want to catch up on your German, that is. 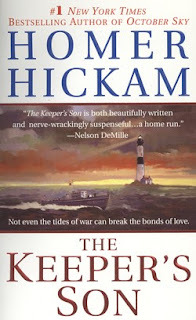 I loved this book, and tore through the 54 chapters in 3 days! It was very clean (no to minimum language, and no gratuitous scenes,) though was slightly graphic since it was a book on war and devastation. And now, I am off to scour our 30 books that we have brought with us for the summer, to find something that looks remotely interesting. 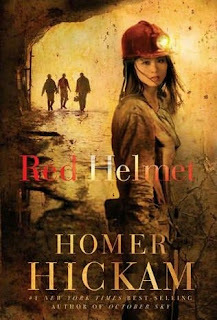 I will purchase "Red Helmet," as soon as possible, but I'm really craving some new stories from Terri Blackstock, which I will probably hunt down in the next day or so! I think I might have to find that book! I love October Sky too. It's one of my favorite movies.